to explore and utilize a variety of styles and genres, from ancient to future, that demonstrate the greatness of God. to find joy and spiritual encouragement working with each other and sharing the gift of music in worship and other opportunities for ministry, both within and outside of Salem. God’s Children Sing is a unique program for our youngest participants. Music, movement, and sensory-motor exploration experiences are combined with faith stories that begin to nurture the spiritual being of this young age. The children, along with a parent, meet on Wednesdays, from 6:00-6:40 p.m. The class is free. The Praise Singers learn about music in worship, theory skills, and vocal technique in really fun ways! The group sings four to six times a year in both the Traditional and Contemporary Services. This group will focus on learning about music, worship, and praising God through fun! We rehearse on Wednesdays from 5:45-6:40 p.m. Register for Praise Singers through KidCheck HERE. If you do not have a KidCheck account, you will need to create one first and then re-click the link to register. 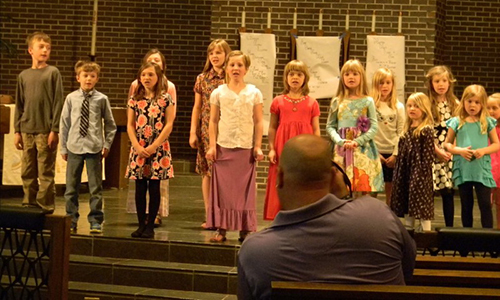 The Joy Singers share their voices by participating in the Traditional and Contemporary Services throughout the year. During Joy Singers rehearsals, students learn how to read music, basic music theory, how to sing with a focused tone and breath support, the role of music in different types of worship, what the Bible says about music, and much, much more! The Joy Singers honor God through music and learning how to serve others through our talents and gifts. We rehearse on Wednesdays from 5:45-6:40 p.m.
Doxology means “a hymn of praise to God.” The group helps lead worship in both the Traditional and the Contemporary Services, singing music from Bach to Barlow Girl. Doxology is a group that desires to impact Salem and the community it resides in by demonstrating unity in Christ through the medium of music. Doxology welcomes any 9th-12th grader with a love for music and a positive, willing spirit. Bells of Glory is a handbell ensemble for new ringers of any age. We ring in worship services 3-4 times a year and participate in a handbell festival in the spring. We are looking for more ringers. Bring a friend and try something new! Rehearsals are on Wednesdays, 5:00-5:40 p.m. The Sanctuary Choir is the primary choir in the Traditional Services. Rehearsals are Wednesday evenings from 7:00 to 8:30. If you love to sing and can commit to the rehearsal and worship schedule, you are encouraged to become a part of this music ministry. Rehearsals have elements of worship, fellowship, aesthetic enjoyment, fun, and spiritual inspiration. The Choir usually sings at 3 out of every 4 Sundays at both Traditional Services. The Salem Handbell Ensemble is comprised of experienced and dedicated ringers who use their talents to glorify God through the unique medium of English Handbells. We play 6-8 times per year in worship services and at the Christmas Concert. We are actively looking for a few more people with music reading ability. We will teach ringing techniques. Rehearsals are Wednesdays, 7:00 – 8:30 p.m. The Salem String Band has a long historic tradition going back to its origins in 1895. The current String Band was organized in 1978 under the direction of Les Schwartz and has been performing and making recordings continuously since then. The Band plays gospel songs accompanied by guitar, mandolin, violin, uke, etc. String Band is open to any man or woman above the beginner level who plays a stringed instrument and enjoys singing and playing familiar gospel music. Salem’s brass ensembles are frequently heard in worship services throughout the year. Various groupings—quartet, quintet, sextet, brass choir—may play a solo selection, accompany a choir anthem, or lead the congregation in hymn singing along with the organ. Rehearsals are scheduled as needed. This is a wonderful way to use your talents with others who also love to play a brass instrument. The Worship Team leading worship in a small team format. Looking for experienced vocalists, and instrumentalists to lead in a variety of musical expressions of worship. Having an understanding of different styles of music is needed. A once a month commitment is requested. Preparation on your own is needed as we rehearse Sundays before the service. Also, in need of volunteers in the audio-visual area. Sound—running the soundboard for the service. Visual Tech—Creating and running power point presentation for services. Songs of our Swedish heritage, both sacred and secular, are the primary repertoire of the Swedish Singers. The ensemble sings in both Swedish and English, performs at the annual Fika in December, and may sing at other events and locations as scheduled. All ages are welcome. Swedish language and pronunciation are taught and reviewed during the rehearsals. Performance and rehearsal schedules are announced in the weekly bulletin. The Swedish Singers will rehearse on Monday evenings in November, preparing for Salem’s Fika celebration in December. New singers (especially tenors) are welcome, and no prior knowledge of Swedish language is necessary….we’ll learn the language along with the music. More details will follow. Please contact Ole (Stu Opel) with any questions, or if you’re a new singer. The Salem Wind Ensemble is a large, multi-generational wind and percussion ensemble. Our goal is to provide an opportunity for Salem members and friends to use their instrumental music talents in praise of God in a worship setting. Participants are in sixth grade or older and have played a wind or percussion instrument for at least two years. Younger members gain skill and confidence by playing with adults, and adult members enjoy helping and encouraging the younger ones. We normally play twice a year in the Traditional Worship Services, once in November and once in April, and in the annual Salem Christmas Concert. There are three rehearsals previous to each worship opportunity. Participants are required to attend at least one of the three. Attending all three is recommended, especially for the younger members. The worship and rehearsal schedule will be printed in the Sunday bulletins. New members are always welcome! If you are thinking about joining, contact Warren or come to a rehearsal and try it out! The Worship Team leading worship in a small team format. Looking for experienced vocalists, and instrumentalists to lead in a varying music expressions of worship. Having an understanding of different styles of music is needed. A once a month commitment is requested. Preparation on your own is needed as we rehearse Sundays before the service. Also, in need of volunteers in the audio-visual area. Sound—running the sound board for the service. Visual Tech—Creating and running power point presentation for services. Celebrating the love of God with joy!